Isleboro Island- Located off the coast of Lincolnville, this 14 mile long island is known best for the guarded privacy of its celebrity residents. 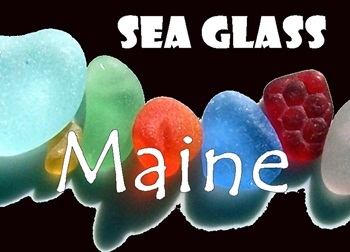 In other words, even though year round residents still generally receive visitors to this somewhat remote island with unequaled "Maine Hospitality", do NOT expect anyone to direct you to Sea Glass Beach! However, I can tell you (mainly because I no longer live there) that this beach is in fact an actual place- although it took me months of searching to actually find it! 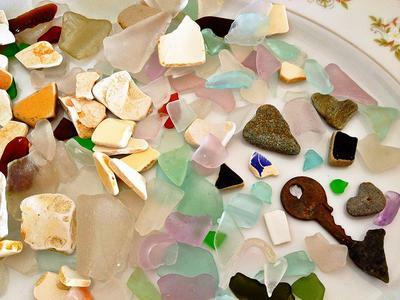 Relatively, anywhere on this island is good hunting for sea glass, but the amount, size and colors depended greatly on the remoteness of the beach. 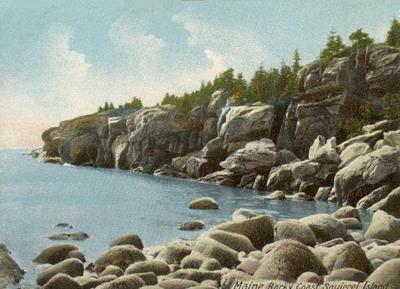 Most of the beaches are private, but there are a few less traveled, such as Turtle Cove on the north side. 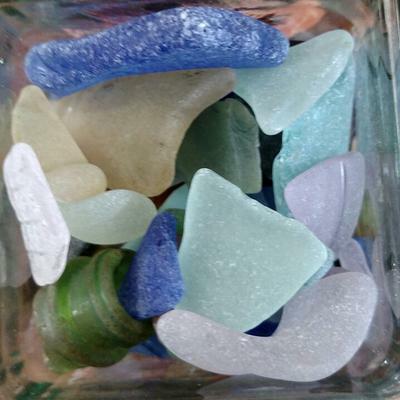 Generally, coves and rocky beaches with minimal foot traffic contain pieces larger than a shard, upwards to complete bottlenecks and bottoms. 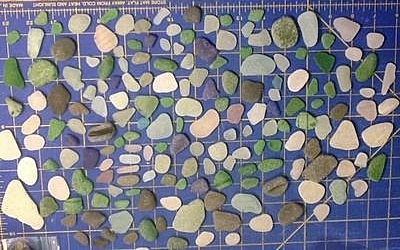 Most of the pieces I found were of Jewelry Grade (*see note below) and range in color from ordinary opaque white to lavender to Kelly Green with a few cobalts and aqua mixed in. there is a ferry which runs daily (until 5pm in winter, the cost is about $30.00 per person one way) from Lincolnville. But I would recommend eating and gassing up your vehicle before crossing the waters, especially in winter! Even in the summer, when the number of residents soars from 600 to 6000, there is one gas station, two general markets, and NO PLACE TO STAY, unless you are fortunate enough to rent a house ahead of time through Homestay or AirBnB. Another word of advice, when looking for a rental, book early and expect to pay a hefty price for a week. 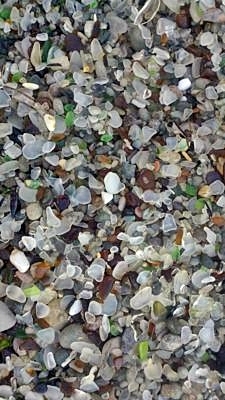 Beach rating: Excellent! * Especially on the north east side of the island. 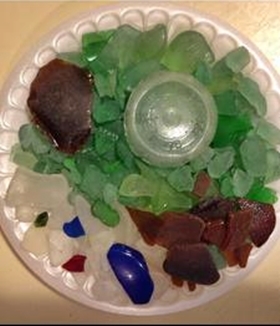 *Note: Although Serafina has rated this beach excellent, the sea glass shown in the photo is mostly craft-grade. 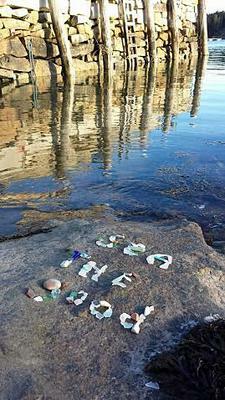 Isleboro Island is quite protected from most waves. 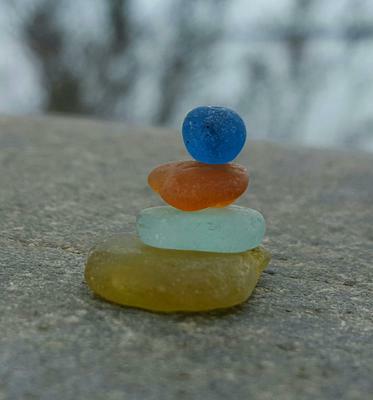 As shown in the photo, some pieces may be jewerly quality (3 small pieces showing), expect to find well-frosted but imperfectly-tumbled sea glass.